All of us have been pretty darn stressed the past few days, but today we took our last exam of the course! Needless to say, all of us can finally take a chill pill and breathe. One by one we stepped out of the wet lab we took our exam in feeling a little lighter…mostly because we were actually floating. First it was Michelle, Andrew B. and myself that decided to jump in with our clothes on to celebrate, and then as we saw people exit the wet lab we called them in to join us. Definitely a great start to the day! 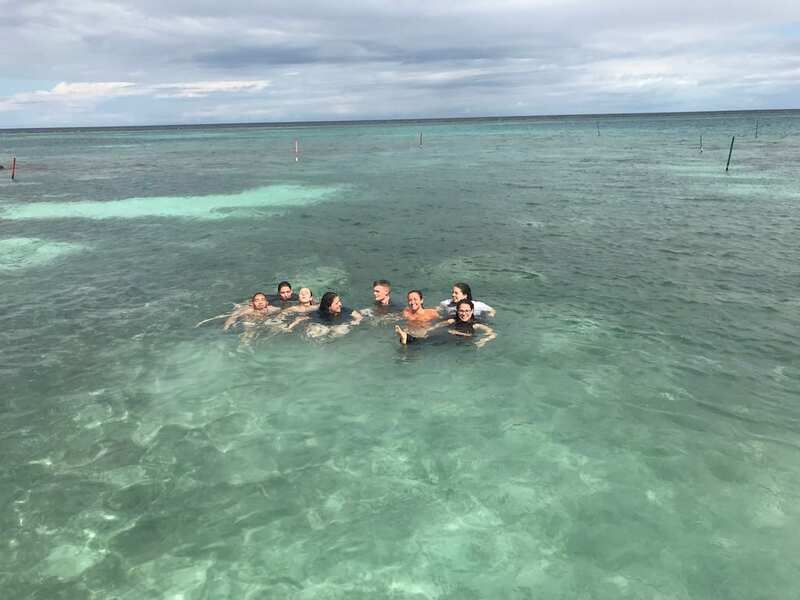 A few of us taking a dip seconds after our final. Our day of excitement didn’t end there. We all dried off, ate lunch and then headed to Green Grotto Cave. 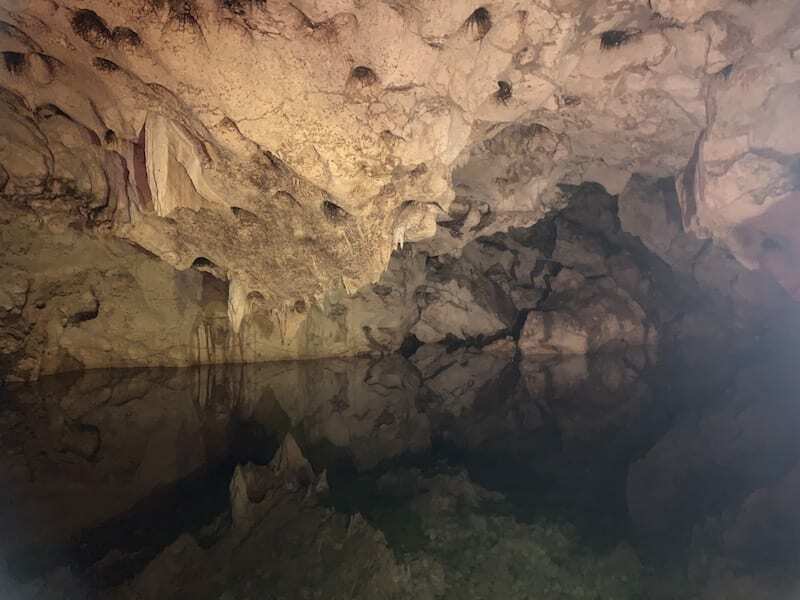 We had a great tour guide that took us through the crevices of the cave, he even told us of some stories, one being about a little girl that drowned down there back when they did boat tours in the waters of the cave; people claim that she still haunts parts of the cave. He also told us about the escape routes that led down to the sea, and at one point he even turned off all the lights to show us what it really felt like navigating the cave in complete and utter darkness. I have no idea how anyone managed to make it out of there but it was super cool nonetheless. The water was so clear it didn’t even look like it was there. 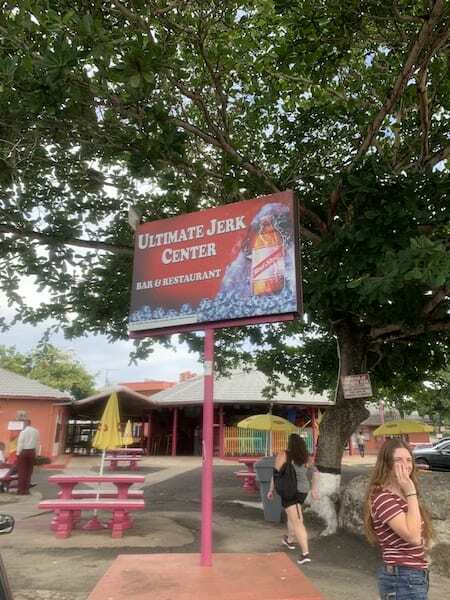 After the cave, we crossed the street to the Ultimate Jerk Center where we had some good jerk chicken while we all enjoyed each other’s company and shared a bunch of laughs. It felt really good to get away from the grounds and de-stress on one of our last days in Jamaica! Unfortunately, tomorrow is our last full day here, and our last dive for those of us who are SCUBA certified. This has been a beyond amazing experience and I’ve met so many awesome people, if I could do it all over again, I would in a heartbeat! The ultimate jerk center ft. Michelle power-walking to the counter.